The sketch was made from a photograph (of a drawing) which Captain Semmes gave to a friend, with the remark that it was a correct picture of his ship. On the stocks, and until she went into commission, the Alabama was known as "No. 290," that being her number on the list of ships built by the Lairds. 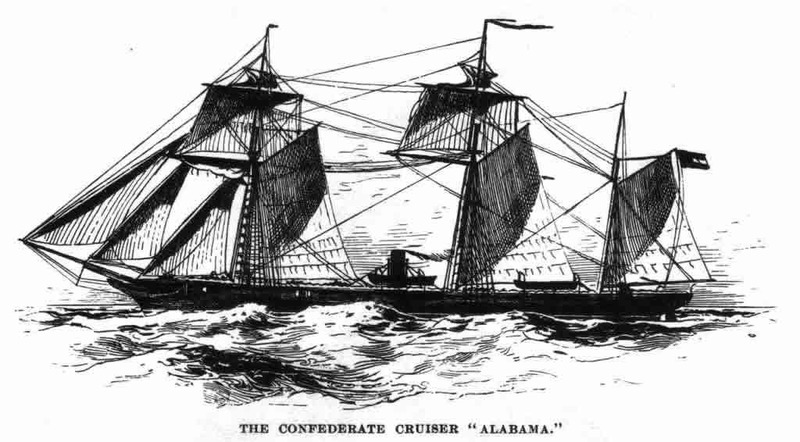 According to the volume, "Our Cruise in the Confederate States' War Steamer Alabama," she was a bark-rigged wooden propeller, of 1040 tons register; length of keel, 210 feet; length over all, 200; bearm, 32; depth, 17. She carried two horizontal engines, each of 300 horse-power; she had stowage for 350 tons of coal. All her standing rigging was of wire. She had a double wheel placed just before the mizzen-mast, and on it was inscribed the motto, "Aide toi et Dieu t'aidera." The bridge was in the center, just before the funnel. She carried five boats: cutter and launch amidships, gig and whale-boat between the main and mizzen mast and dingey astern. The main deck was pierced for twelve bulwarks. Her cabin accommodations were first-class; and her ward-room was furnished with a handsome suite of state-rooms. The starboard steerage was for midshipmen, the port for engineers. Next came the engine room, coal bunkers, etc. : then the berth-deck, accommodation 120 men. Under the ward-room were store-rooms and under the steerage were shell-rooms. Just forward of the fire-room came the hold, next the magazines, and, forward of all, the boatswain's and sailmaker's store-rooms. The hold was all under the berth-deck. - EDITORS.